Clinically researched probiotic - VEGAN & DAIRY-FREE! Researched Nutritionals Prescript-Assist Pro™ is a broad-spectrum probiotic with 30 plus soil based, pH-resistant micro flora. They have changed the capsule to a vegetarian source so the product is now Vegan. Under a physician’s direction, this product my have special dietary usefulness for individuals diagnosed with irritable bowel syndrome, colitis, and/or those patients undergoing antibiotic treatment. It is also useful for individuals traveling overseas. SBO’s are soil-based probiotic organisms found in healthy soils which produce and release powerful enzymes that prepare and purify soil to support plant growth. Natural soil is a living biomass composed of SBO’s, fungi, yeasts, and microscopic insects. The role of SBO's is to keep the soil biomass in a healthy dynamic balance that supports the growth of plants and animals. Additionally, SBO’s simultaneously produce and release specific nutrients necessary to accelerate plant development and reproduction. SBO’s play the same role in the gut as they do in the soil: supporting the healthy growth of organisms. Many forms of SBO, as well as their enzyme and nutrient byproducts, are consumed when humans eat fresh, organically-grown fruits and vegetables. SBO consumption was widespread when, prior to the 20th century, people ate foods fresh from fields and gardens. Today, our food processing techniques combined with fungicides, herbicides and heat destroy most or all of these friendly soil-based organisms in our food supply. SBO’s are rapidly expended in their fight against acidity, pathogens, and other destabilizing elements. Consequently, restoring, or maintaining GI health depends on a constant supply of SBO’s. Yogurt is an acidophilus based probiotic. It is made with commercial milk, which generally includes antibiotic and hormone residues. Acidophilus is not acid-resistant and so has great difficulty surviving stomach acid. 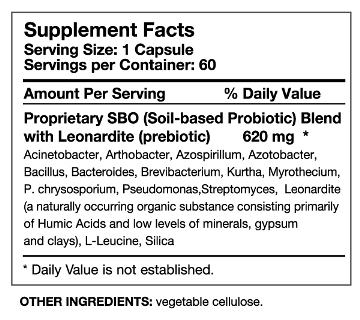 In contrast SBO’s, being soil-based, contain no antibiotic or hormone residues, there is no potential for lactose-intolerance side-effects, and SBO’s do not need to be refrigerated (a convenience when traveling). SBO’s promote a healthy immune system (creating a huge pool of uncoded antibodies) and break down hydrocarbons, thereby increasing overall absorption of nutrients. They promote a healthy digestive system whose goal is an effective elimination process and elimination of pathological yeasts, molds, viruses and fungi. Suggested Use: As a dietary supplement, take one capsule twice daily 30 minutes before eating or as directed by your health care professional. Free of: corn, sugar, salt, preservatives, eggs, fish, crustacean shellfish, tree nuts, soy, peanuts, wheat, gluten, and artificial flavors.